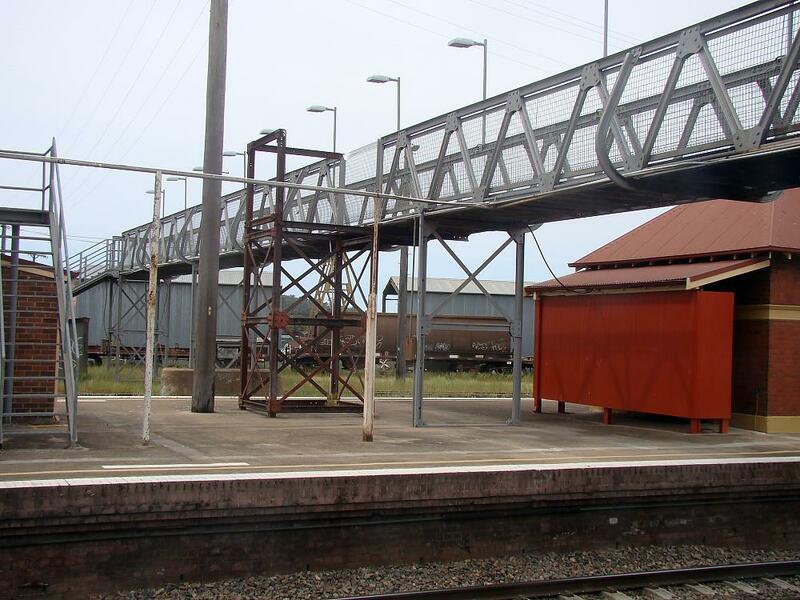 The real footbridge at Goulburn where it passes across the island platform. With all the track laid on all modules we pushed on with more buildings and structures for the layout, as well as continuing on the wiring. 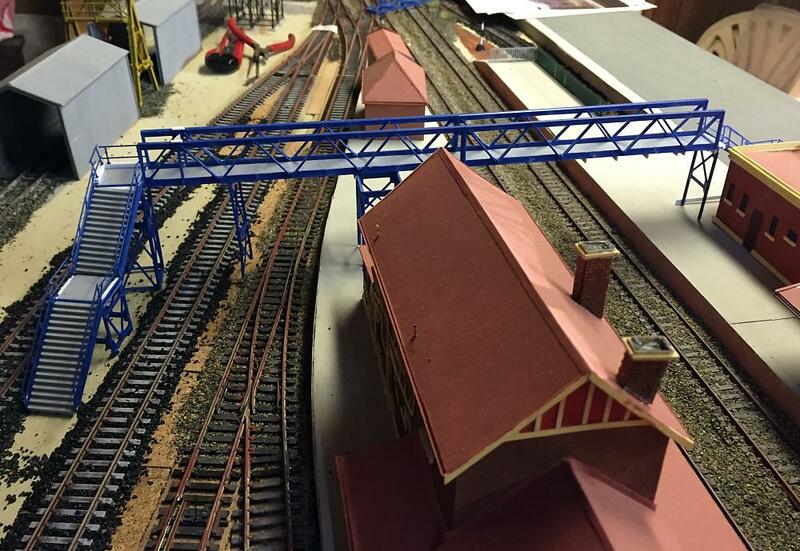 Our deadline for getting the layout operational is the Thornleigh exhibition on the June long weekend. The main long footbridge at the south end of the station travels right across the station from the street level out the front to a pedestrian walkway on the far side. We obtained the drawing of this footbridge from the railways and also had several good photos to work from. Two Kibri footbridge kits were used as the basis and were kitbashed together to represent the real bridge. Our model is a bit shorter than the prototype but it is still quite a lengthy structure. Firstly we spliced enough of the elevated walkway parts together to achieve the required length we needed. This was done for the grey base and then for each of the blue sides. A small extra piece of the grey base (left over from the previously constructed north end footbridge) was added at the far end, with an angle cut on one side to accommodate the angled flight of stairs at this end. All joins and splices were reinforced with small thin pieces of styrene. Next we trimmed down two lots of the flights of stairs to achieve the overall height we needed. As supplied the Kibri stairs make the elevated walkway sit very high in the air. We lowered ours significantly to be closer to the size in the drawing and to be really sure we also tested it for clearance with some appropriate rolling stock. Each flight of stairs was fixed to the elevated walkway and the joins were reinforced with extra styrene. Then it was a matter of tackling each of the supporting trestles in turn, constructing them and trimming them to length as required to match the vertical clearances appropriate for their location either under the walkway or under the stair landings. The trestles were also fixed to the walkway and the joins reinforced. 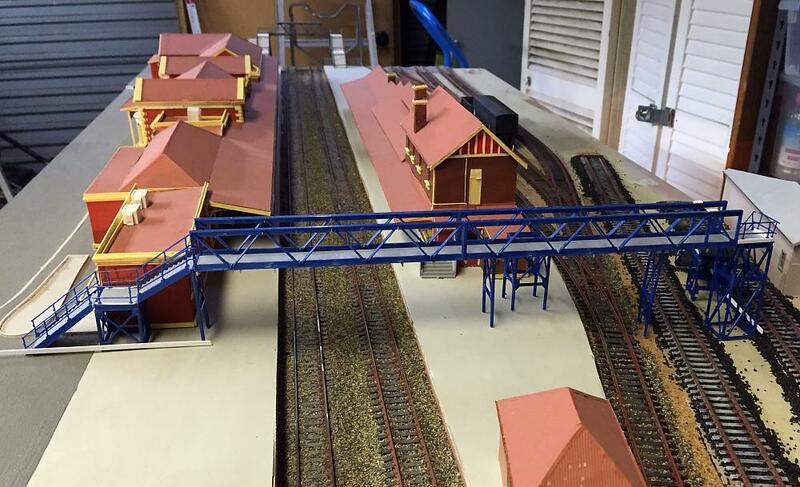 After a quick test fit to make sure the completed footbridge would fit (and a couple of quick pics for this update), the model footbridge was put aside for final detailing and painting at a later date. Main footbridge constructed and positioned for checking, viewed from the Sydney end of module. Main footbridge constructed and positioned for checking, viewed from country end of module. With all of the track now laid down and the wire droppers in place for track power wiring, we were able to start track ballasting in earnest. We had previously ballasted a few small areas where it would be difficult to get to later on, mainly around the station platforms. 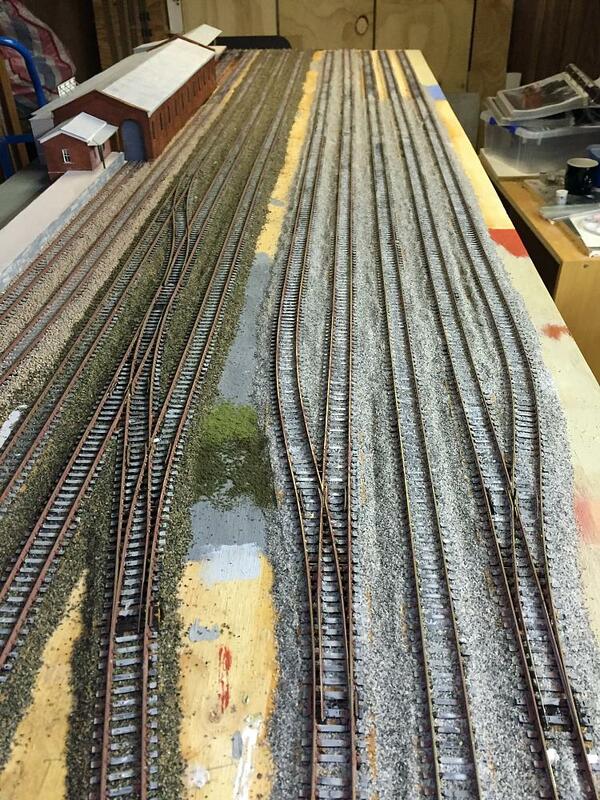 We used Chucks Ballast "Marulan" for all main lines and used lighter grey mixes for the sidings. After applying all the ballast dry and spreading it out to achieve the formations and profiles we were after, we sprayed it with 'wet water' (water with a few drops of detergent mixed in to break up the surface tension). White glue, diluted roughly 50:50 with water was then applied. The broad areas of open track were sprayed and for the tighter areas around points and structures where we had to be more careful, eye droppers loaded with the mixture were used. Once the glue is applied it is important not to disturb the ballast until it is fully dry. All that we did was to carefully remove any errant pieces of ballast from any spots where we did not want them. There are lots of small detail items still to be added all around the yards and siding areas. Main line tracks and most of the sidings ballasted on the Goods Shed module.